The team’s study was published in Nature Communications on March 11, 2019. A cavity-QED system is a system in which photons – elementary quanta of light – and atoms are confined within an optical resonator and interact with each other in a quantum-mechanical manner. 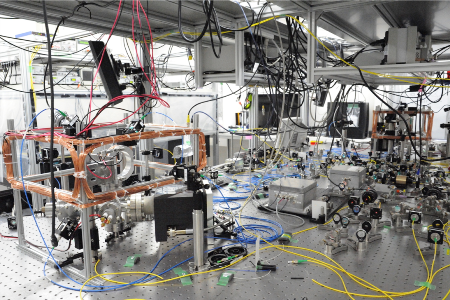 This system has been a prototypical experimental platform for helping scientists to better understand and manipulate the quantum properties of photons and atoms, as highlighted by the award of the Nobel Prize in 2012 to physicist Serge Haroche for his ‘groundbreaking experimental methods that enable measuring and manipulation of individual quantum systems.’ Consequently, the expectation for cavity-QED systems to realize quantum information science technology has increased. In order to realize such technology, integrating multiple cavity-QED systems with coherent, reversible coupling between each system was necessary, but obtaining such coupling with high enough efficiency has made this very challenging. Aoki and his team approached this problem by demonstrating a system consisting of two nanofiber cavity-QED systems connected to each other in an all-fiber fashion. This enabled the team to observe a reversible interaction between atoms and delocalized photons separated by unprecedented distances of up to two meters, a first in any such quantum optical system. Their system also paves the way for the study of many-body physics — the collective behavior of interacting particles in large numbers — with atoms and photons in a network of cavity QED systems, including phenomena such as quantum phase transitions of light. The team is now making technical improvements to the setup to extend their work to the construction of a fiber network of coherently coupled, single-atom cavity QED systems. This includes reduction of uncontrolled losses in the cavities, active stabilization of the cavity resonance frequencies, and extension of the lifetimes of the atoms in the traps that hold them near the nanofibers.